The homeless have energy, but not the skills or the opportunity to earn an income to take them off the streets. 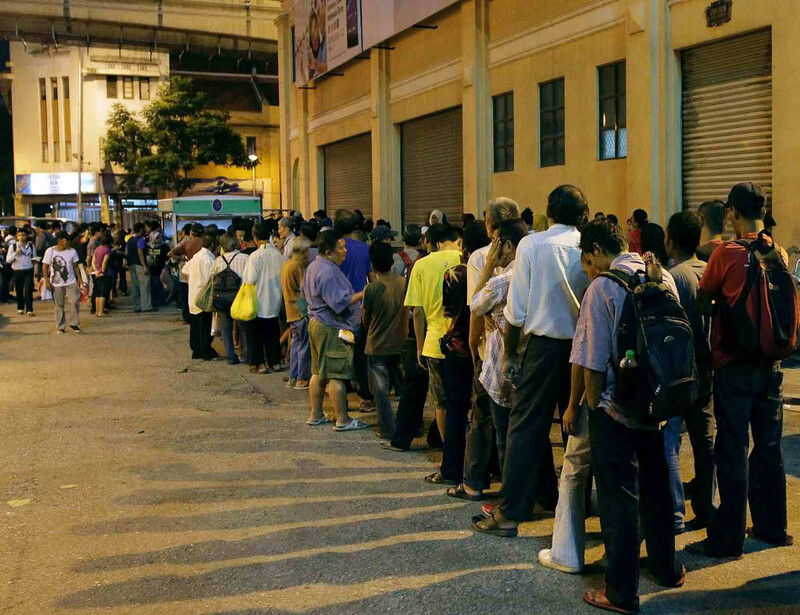 I was given the opportunity to spend last Saturday evening with the homeless of Chow Kit, Kuala Lumpur. It was a wet night but they came in droves, packing the sidewalk for hours in anticipation of the various NGOs who would distribute food and clothes. I mingled with the crowd and what struck me that night was that they were happy or, at least, not sad. They were chatting and laughing among themselves, and when the food and clothing arrived, they lined up in an orderly fashion for their meal and also to pick out the clothes. There were smiles all around as the kids ran and chased each other, or sat together, playing hand games. I spoke to one, asking him if he looked forward to nights like this and he replied: "It's like this every night. It's just that no one sees us." As the NGOs continued to distribute much welcomed food and clothes, it got me thinking. Is this what they need? The obvious answer was yes, the less obvious answer was, what else is there? The children sat together on a mat. A teacher, playfully named Datin Susu (because she would also distribute milk to the children), taught them how to sing songs, read and put together building blocks. "Singing is one of the best ways to learn. It teaches the children discipline, teamwork, rhythm and exercises their ability to remember and think in the moment," she shared. Education is the only way to break the cycle of poverty. Of the children sitting on the mat, perhaps a handful will make it to school, and that's a good thing. What about the parents, the adults? The NGO I was with was in the news, looking to raise funds through a charity concert with celebrities so that they could build a shelter to provide short-term relief to the homeless. I couldn't help but feel that though this was important, it wasn't enough. What the homeless adults needed were skills, not just an education. Many of them looked physically capable and were passionate about finding a job. There were very few with slumped shoulders of defeat. They have energy, but not the skills or the opportunity to earn a regular income that would take them off the streets. We have vocational institutions in this country, places where someone can learn how to wire a house, mow a lawn or landscape a garden, cut hair, or sew a dress. We need to find a way where these organisations can provide the homeless with the skills they need to find jobs that will give them a chance to move away from this life, if they so choose. Those who can pay for these courses can subsidise those who can't. Let them equip themselves for free, and we'll find that their contribution to society will be tenfold. An elderly man who had been munching on an apple stopped and asked me, "What are you doing?" while waving the apple at my camera. "I'm taking photographs," I said. "Show me how," he said, putting the half-eaten apple in his pocket and stretching his hands to reach out to me. Aizuddin Danian, born and bred in Kuala Lumpur,is a passionate photographer and sees himself as a young man in an old world. He believes that the day we stop having opinions is the day not worth living for. A scene of several homeless youths bunking down for the night in Pudu, Kuala Lumpur. 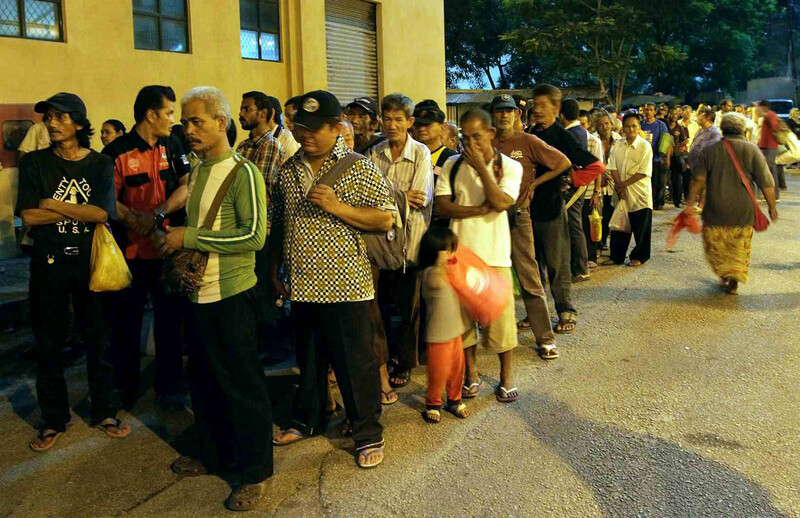 Their plight comes at a time when the Malaysian government announced that soup kitchens would not be allowed within a 2km radius of Lot 10 in KL. 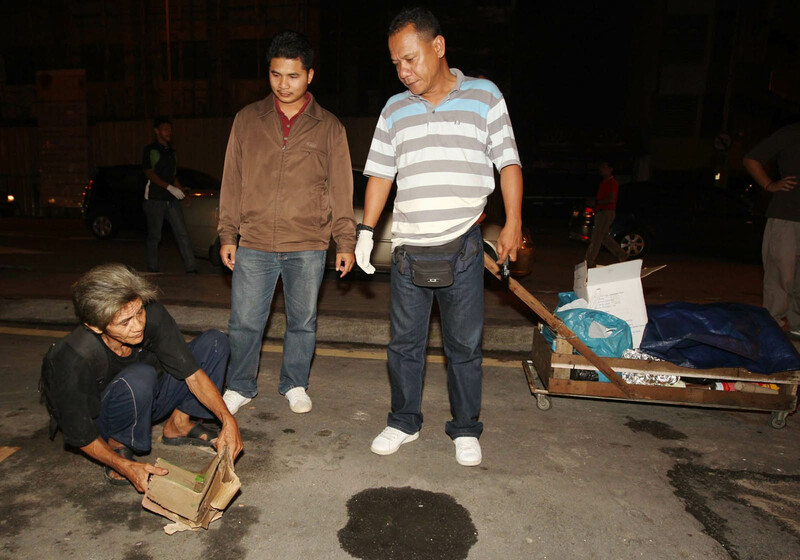 Federal Territories Minister Tengku Adnan Tengku Mansor said the activity encouraged people to remain homeless and jobless, with an added result of litter and disease-carrying scavengers. But soup kitchen operators have been defying the order and supplying food to the needy and homeless. 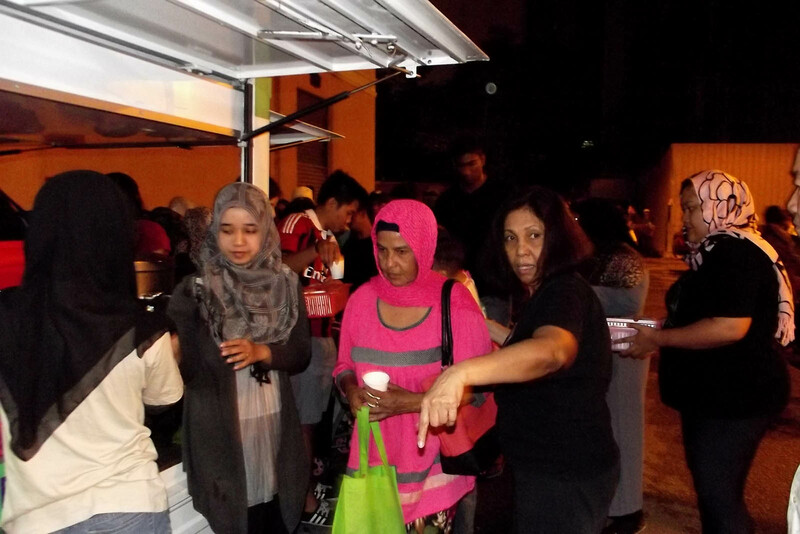 Ms Munira Abdul Hamid, founder of Pertiwi Soup Kitchen, which gives out food to the needy. 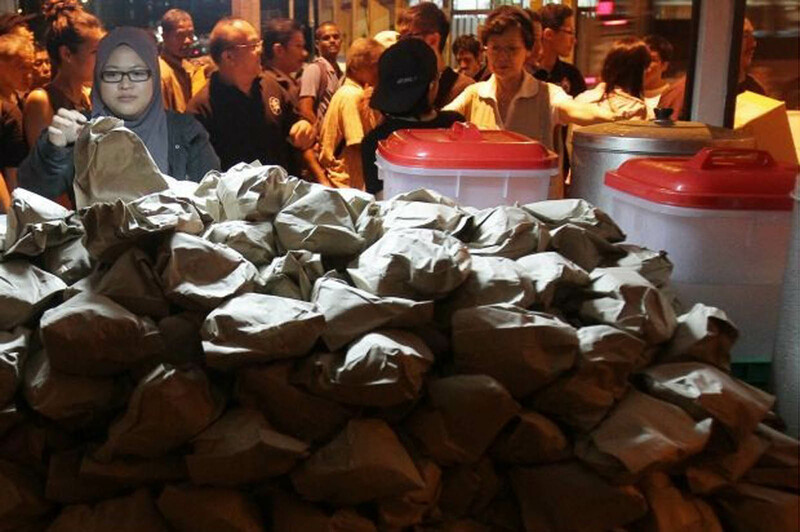 Pertiwi hands out meals four times a week to the homeless and poor in Kuala Lumpur. It gives out meals to 800 people a night or 12,000 monthly. 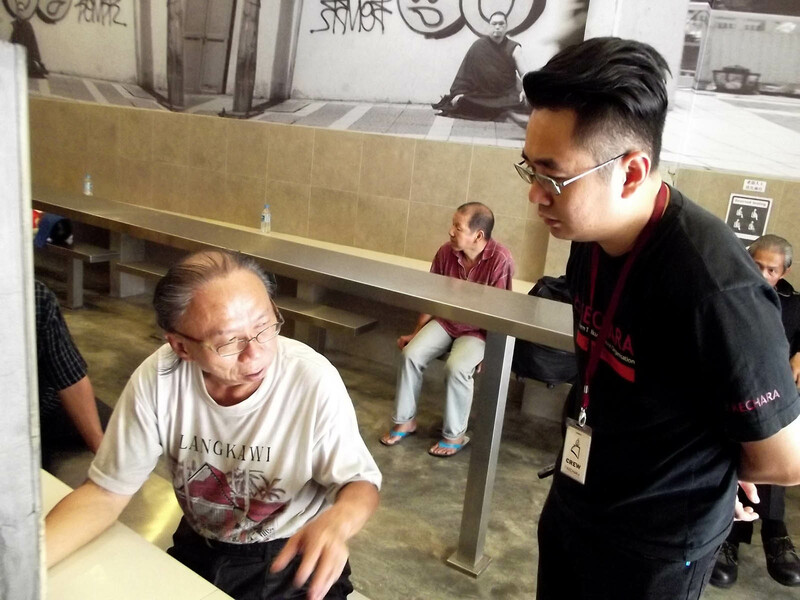 Mr Justin Cheah (right), project director of Buddhist-run Kechara Soup Kitchen, persuading Jeffrey Yong, who has cataracts and homeless, to live in a shelter in Kuala Lumpur until his eyes are better. 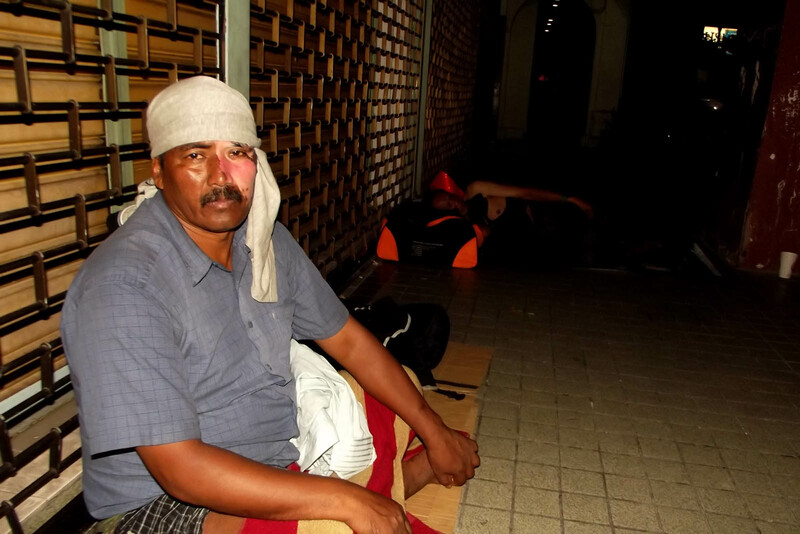 Mr S. Sathi, lost his job and became homeless after suffering an acid attack in 2012. He lost all his belongings, including his identification documents and savings. 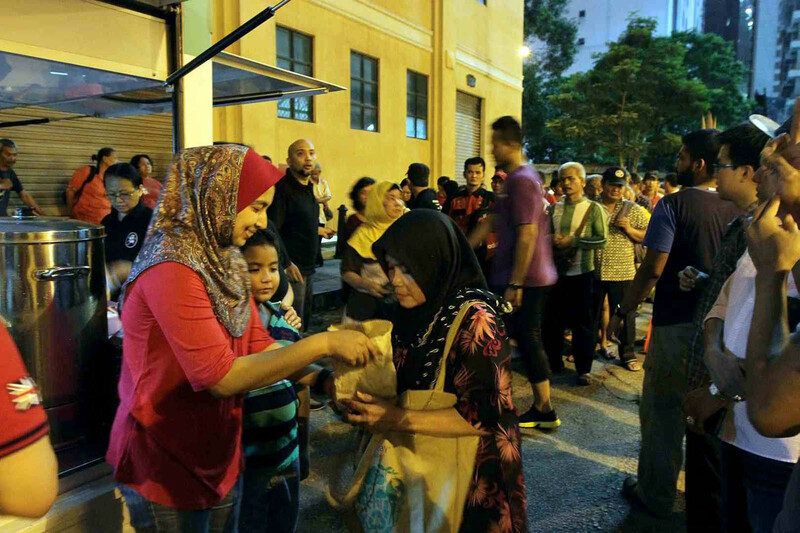 Meanwhile, Prime Minister Najib Razak will hold discussions with soup kitchens to reach an amicable outcome for all affected parties. 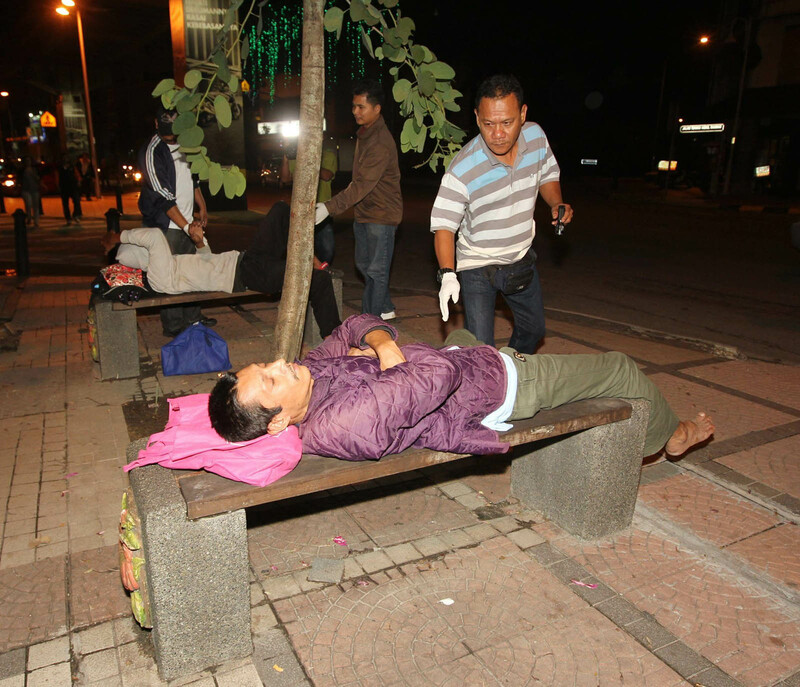 He also stressed that the government remains concerned about the dilemma faced by the homeless.